Ross Douthat is an author, op-ed columnist for The New York Times, and film critic for National Review. Ross Douthat joined The New York Times as an Op-Ed columnist in April 2009. Previously, he was a senior editor at The Atlantic and a blogger for theatlantic.com. He is the author of “Bad Religion: How We Became a Nation of Heretics,” published in 2012, and “Privilege: Harvard and the Education of the Ruling Class” (2005), and a co-author, with Reihan Salam, of “Grand New Party: How Republicans Can Win the Working Class and Save the American Dream” (2008). Read his blog, Evaluations, and follow him on Twitter. What Can Philosophy Tell Us About Angels? Despite her premature death at age 39, Flannery O’Connor left behind one of the most haunting and strikingly original bodies of work in 20th Century literature. With the rural South as her backdrop, she brought to life a string of eccentric characters torn between their worldly ambitions and the need for a more enduring truth. This film traces the people and events that shaped her remarkable career, as well as the important role that Catholicism played in her writing. Featuring expert commentary and rare photographs, Uncommon Grace will give you a new appreciation for this highly celebrated, yet often misunderstood, storyteller. Dr. Sullivan is the Secretary for Catholic Education for the Archdiocese of Washington, and teaches at the Pontifical Faculty of the Immaculate Conception in Washington, DC. She is the author of the book The Beauty of Faith. Sponsored by the Catholic Artists Society. You may listen to the lecture on Soundcloud here. Fr. Dominic Langevin, OP (Pontifical Faculty of the Immaculate Conception), presented the opening lectures for the annual Wisdom of Aquinas series at NYU with an afternoon considering St. Thomas Aquinas’s teaching on the sacraments, and our participation in the sacramental life. You may listen to the lectures on Soundcloud here and here. Marie I. George is Professor of Philosophy at St. John’s University, NY and author of Stewardship of Creation: What Catholics should know about Church teaching on the environment (2009). The lecture was co-sponsored by the Thomistic Institute. What if there were a simple solution to world hunger? Mary’s Meals believes that solution is food, and education. Mary’s Meals provides one good meal to some of the world’s poorest children every school day. By focusing on one goal – that every child receives a nutritious daily meal in a place of education, Mary’s Meals changes lives, and undermines global poverty. Magnus MacFarlane-Barrow, is the CEO and founder of Mary’s Meals, and the author of The Shed that Fed a Million Children. In 2015, Magnus was one of Time magazine’s 100 most influential people (with former UK prime minister Gordon Brown as author of the bio), and in 2010 Magnus was named one of CNN’s Heroes.The evening included a showing of their beautiful new film, Generation Hope, and then brief remarks by Magnus with time for Q and A. Learn more about Mary’s Meals here. 1:00 pm: The Catholic Center takes Central Park. A picnic and games in Central Park! 7:00 pm: Taste of the Village Dinner: Sponsored by the Newman Catholic Undergraduate Fellowship. 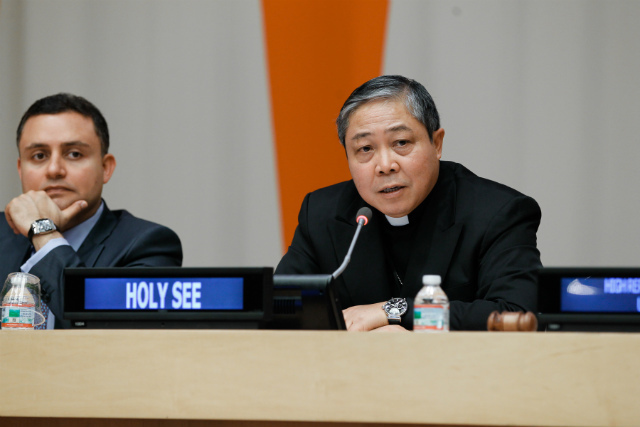 The NYU student UN Initiative and the Catholic Center at NYU held a discussion with the Permanent Observer Mission of the Holy See to the United Nations, His Excellency The Most Reverend Archbishop Bernardito Auza, Apostolic Nuncio to the UN. Pope Francis’s personal representative spoke on topics such as climate change, poverty, the Pope, and the work of a UN representative! Fr. Dominic Legge, O.P. (The Pontifical Faculty of the Immaculate Conception), Prof. Charles Kesler (Claremont McKenna College), and Prof. Nigel Biggar (Oxford University) and a panel consisting of Sherif Girgis (author of What Is Marriage? Man and Woman: A Defense), Adrian Vermeule (Harvard University), Chad Pecknold (Catholic University of America) and Vincent Phillip Munoz (University of Notre Dame) discussed natural rights and modern questions.